An apartment building in Montreal's Shaughnessy Village neighbourhood. 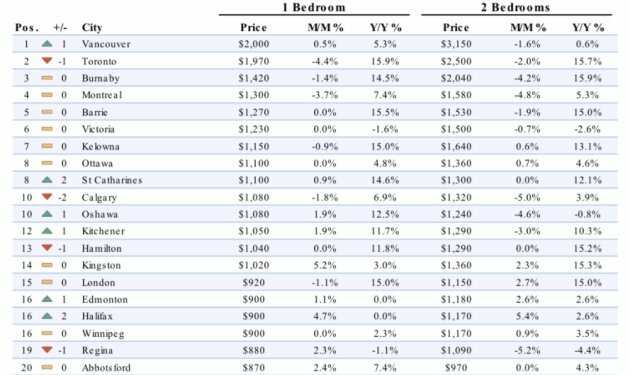 Montreal is among the cities where rental rates have fallen, according to data from Padmapper. The slowdown in Canada's residential real estate market may now be spreading to the rental market, with rents falling in many cities after a prolonged period of rapid growth. That could be good news for renters in Toronto and Vancouver, where rents were rising at double-digit rates in recent years, and where few vacant apartments can be found. According to data from rental site Padmapper, the average one-bedroom apartment in Toronto fell by 4.4 per cent in February, to an average of $1,970. Two-bedroom units fell by 2 per cent to an average of $2,500. Prices for one-bedroom apartments also fell in Calgary, Montreal and Quebec City. They were flat in Ottawa and Edmonton, and rose slightly — by 0.5 per cent — in Vancouver. That's not to say apartments are suddenly more affordable; in many cities, prices are still considerably higher than they were a year ago. 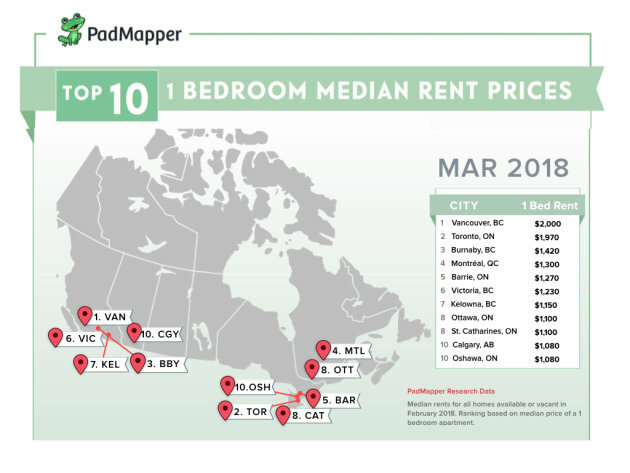 In Toronto, which has seen the strongest price growth of any city in the past year, one-bedroom units are still 15.9 per cent more expensive than a year ago, Padmapper's data shows. It's common for the rental market to slow down in the winter months, but it "just seems to have hit harder this year than previous years," a Padmapper spokesperson told HuffPost Canada. "The recent slowdown in home sales could definitely be a factor in this, but as the months warm up and more people start to move, that is when we will see if rental rates are actually softening (compared to) previous years' hot markets." A slowdown in price growth would be welcome relief to tenants, especially in Toronto and Vancouver, where apartment vacancy rates have fallen to absurdly low levels — 1 per cent and 0.7 per cent, respectively, according to the latest estimates from Canada Mortgage and Housing Corp.
That lack of rental housing supply is beginning to have noticeable social consequences. In Vancouver, news reports suggest a growing number of people are living in their cars. In Toronto, tenants are starting to confront landlords over "renovictions" — the phenomenon of building owners pushing out tenants in order to renovate apartments and then rent them out at much higher rates. Ontario's housing minister, Peter Milczyn, said this week he wants to limit renovictions, and will review the province's tenant act "to see if changes need to be made."